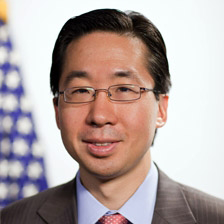 Todd Park, United States Chief Technology Officer, appointed by President Obama in March, 2012, after serving as CTO of the Department of Health and Human Services, where he led the initial development of the Web site Healthcare.gov. In October, 2013, when that site first began volume production, its performance was so severely unacceptable that it was widely viewed as the cause of a public relations disaster for the administration. Dr. Park, having left HHS nearly 19 months earlier, was not knowledgable with respect to the current or recent development of the Web site, and could not really be held accountable for the site's problems by anyone familiar with the true meaning of "19 months" in the world of technology. Nevertheless, in early November, Rep. Darrell Issa (R-California), Chairman of the Oversight and Government Reform Committee of the U.S. House of Representatives, demanded that Dr. Park appear at a hearing to testify before the committee regarding the problems of Healthcare.gov. When the administration requested a two-week delay in the appearance, asserting that for the time being, Dr. Park was too busy trying to guide the recovery of Healthcare.gov, the Committee issued a subpoena for Dr. Park's immediate appearance, and Dr. Park did appear. Based on public accounts, we cannot know for certain anything at all about Chairman Issa's motivations in this investigation. However, this incident does serve exceedingly well as a template for detractors of a project to use review and investigation to distract project leadership and senior management from addressing the issues of a troubled project, thus potentially compelling Reality to comply with the force of the detractor's own jaundiced predictions. When a project's detractors have been unable to prevent the organization from committing to the undertaking, they sometimes feel compelled to prove their own objections valid by ensuring the project's failure. Unfortunately, there is much they can do. Here's Part II of our catalog, emphasizing tactics that cause chaos. Although outsourcing advocates often claim cost advantages, results depend strongly on what is actually outsourced. If the outsourced work cannot be cleanly partitioned from other tasks, and if it demands close collaboration with those other tasks, outsourcing it could actually degrade project performance. By advocating for aggressive outsourcing policy affecting the target project, detractors can effectively hinder progress. Reorganizing, relocating, or imposing system upgrades on the segments of the enterprise that most directly provide project resources does introduce chaos. But for special harm, detractors can time these changes for the months immediately preceding major milestones. Raiding the project and its task teams for staff for other projects can slow development in two ways. First, it deprives the project of needed capability. Second, the project will likely have to be replanned to account for the lower level of availability of the raided staff. Maximum disruption occurs when the staff reallocation takes place when work is already underway. Changing requirements mid-project is another powerful approach. For detractors, customer-oriented requirements are difficult to change, unless the detractor is also a customer. For detractors who aren't customers, internal development procedures and regulatory compliance procedures offer rich possibilities. Imposing changes in these procedures can degrade project performance, if a way can be found to avoid affecting other more favored projects. Changes in organizational policies other than those affecting development procedures can also be disruptive. For example, if a detractor's subordinate is assigned to the project and has been telecommuting two days per week, the detractor can require that the subordinate telecommute at most one day per week. For someone with a long commute, such a restriction can be disruptive. project performancetarget project with another project "to achieve savings by reducing duplication" can degrade project performance, especially if the target is combined with a troubled project. If the tactics above work as intended, and project performance falters, the missed deadlines and budget overruns can provide detractors with justifications for demanding a review of the project. The review in itself becomes another hindrance for the project, because it's a further burden on project leadership, and because it can lead to yet more turmoil if its recommendations include reorganization or changes in leadership. Threats of review can also make recruitment and retention of project staff more difficult. Would you like to see your comments posted here? rbrenzewgloGXxATrYefaner@ChacSrokqyPNCpbGgZhGoCanyon.comSend me your comments by email, or by Web form. I offer email and telephone coaching at both corporate and individual rates. Contact Rick for details at rbrensYhNtZAaBgcNnbTmner@ChacGpQyFiPlhduYzMlOoCanyon.com or (650) 787-6475, or toll-free in the continental US at (866) 378-5470.